Luigi ‘Gigi’ Dall’Igna won a lot of trophies with Aprilia where he started working in 1992. In total he can boast 47 titles: 22 in 125 cc (12 riders titles + 10 Manufacturers) 20 in 250cc (10 riders + 10 Manufacturers) and five in World Superbike (2 riders + 3 manufacturers). His dream? Winning the MotoGP title. In November 2013 he joined Ducati to accomplish a demanding task: recapture the Ducati competitiveness that produced a MotoGP World Championship win with Casey Stoner in 2007. The arrival of Dall’Igna produced a revolution inside the company. He first focused on improving communication between the riders, the mechanics and the engineers, before he took care of the technological side. Designed from scratch, the new GP15 has been a great success since Dall’Igna oversaw its debut and after nine rounds Ducati are no longer a surprise package. They are once again a solid, championship-fighting factory with both riders - Andrea Iannone and Andrea Dovizioso - respectively third and fifth in the title standings and on the cusp of securing a first Ducati MotoGP victory since October 2010. Bikesport News: Going back to how it all started, how was your first day at Ducati? Gigi Dall’Igna: It was weird. At first I was felt like the enemy, because I joined Ducati after having worked 22 years for Aprilia, one of the main competitors. The first day I didn’t know what to expect. I arrived in a difficult moment for Ducati. People were demotivated for the lack of results and you could feel it, but I found a great passion. They understood that I wanted to go in a different direction, they trusted me and now I feel that I’m part of Ducati. I’m welcomed as I have always been here. BSN: How did you enjoy the night at Losail with the double podium? GD’I: I was disappointed at first, because during the race the victory was really close, but soon prevailed the satisfaction for the work done by the whole racing department. I joined Ducati in November 2013. The first months were dedicated to know the people and to reorganize the work. In May 2014 we started to think about the GP15 project. The bike was completely new and the realization of some parts, such as the new engine, for example, required a lot of time. We switched on the engine for the first time at the beginning of February 2015 and it was brought on track at the end of the month at Sepang for the test. Having two riders on the podium in the opening round was beyond our expectations. BSN: Which is the strongest point of the Ducati racing Department? GD’I: A company is made of people. At Ducati I found a very high technical and human level. In a meeting you can discuss but, once a decision is taken, everybody respects it. The most important thing is to work as a team. I need the people that work for me and I believe that without them I couldn’t have achieved all this. BSN: Is it mission accomplished? GD’I: No, we are here trying to win the world title. Until Ducati has won the MotoGP title, I cannot say that the mission has been accomplished. Of course it’s a process. Last year we aimed at reducing the gap with the fastest rider to 10 seconds and we made it. This year our target is to win a race. These are only halfway points to our goal though, as winning the title is the real aim. 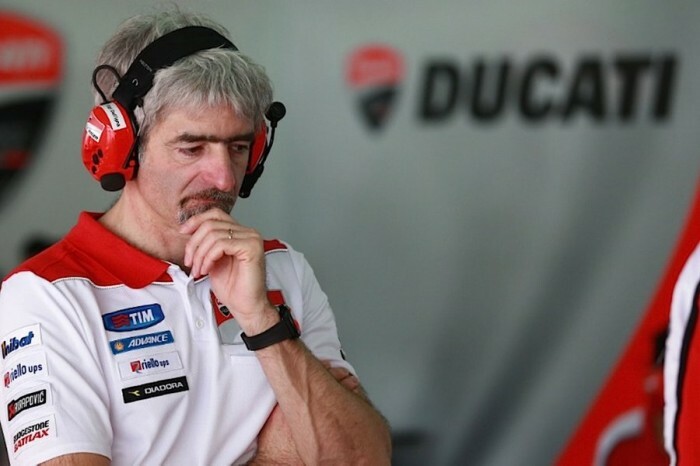 BSN: Nobody doubts about the competitiveness of Ducati. Only a victory is missing. How close to that win do you believe you are? GD’I: I believed in the possibility to claim a win before the start of the season. Now the feeling is even stronger. We are close to this goal. We will need to put even more energy to meet this target. Ducati is third and fifth in the championship, we are fighting every Sunday with Yamaha and Honda and you cannot give this performance for granted. We believed a lot in the GP15 and the track results are confirming that we were right. BSN: Do you have already an idea on which track you could clinch the first victory? GD’I: There are several tracks where we can do well and (Andreas) Dovizioso and Iannone have different styles that adapt well to different circuits. But it won’t be easy, the level this year is really high and winning would mean beating Honda and Yamaha, means beating Valentino Rossi, Marc Marquez and Jorge Lorenzo. BSN: Looking at the GP15, did you study the engine before joining Ducati and have you thought of doing different? GD’I: I didn’t study the Desmo before joining Ducati but I never put it into question. The setup of this system is very complicated, so if I weren’t in Ducati, probably I wouldn’t have chosen this kind of technology. Considering the experience and the know-how that I found at Ducati, I think that the Desmo is a strong point because it has some characteristics that the systems used by our competitors do not have. In particular the reduction of the frictions, when they are not needed. For example, at the lowest ranges. BSN: How different is the engine of the GP15 compared to the GP14? GD’I: It is completely different. The power is similar as the issue was not the power. Last year we worked a lot at the development of the GP14 engine and the thermodynamics of the old engine was transferred on the GP15. It was important to reduce the size, because a smaller engine allows you to do more extreme settings. BSN: Which are the strongest and the weakest points of the GP15? GD’I: In the past the riders struggled to make the bike turn. This means that after some laps it was more tiring for the rider. The GP15 allows it to make specific lines at a specific speed requiring less energy, sparing both the struggles of rider and tyres. From the beginning of last year to the first races of 2015, we have gained around 7-8 tenths per lap. Of course the key was to test on the GP14 the new things in preparation of the GP15. In the first races we struggled a bit under braking but we have progressed. Compared to our competitors, what we need to improve is the grip on the rear. BSN: How has the GP15 progressed from the beginning of the season? GD’I: For sure we know the bike a bit better. Honestly, I expected some more significant steps forward. We understood that there are some tracks where we are struggling. This is a point that will help us to progress and to focus the development in the future. In this moment we are suffering more on the circuits with less grip. This is an issue we will work on in order to improve. BSN: Starting at Assen a few rounds ago, electronics are now frozen. Will this affect Ducati’s development? GD’I: We planned some important development of the electronics in the first part of the year, so I believe that we are fine from now until the end of the season. BSN: Does the introduction of the single ECU represent an epochal change? GD’I: It’s a very important change that helped MotoGP to have much more manufacturers lined up on the grid. The single ECU reduces considerably the technological barrier that is necessary to enter this world, so that new manufacturers can try and close the technological gap in a shorter time. In addition to this, there are also the new rules that support new factory teams joining MotoGP. BSN: What will have more effect in 2016, the single ECU or the tyre change from Bridgestone to Michelin? GD’I: They are both two key elements of the modern MotoGP and it’s difficult to say which one is more significant. It depends how the teams react to both these big changes. The teams that will succeed to understand earlier than the others the strengths and the weakness of the single ECU and the new tyres will have an important advantage next year. BSN: Will this shuffle the pack? GD’I: It’s reasonable to expect that the “old” values may change, but it may not happen. BSN: What is Ducati policy regarding satellite teams with the new financial support provided by Dorna in 2017? GD’I: The satellite teams are definitely important partners for Ducati as they help us to grow the riders. It happened with Andrea Iannone, who gained great experience in the Pramac Ducati Team. Considered that he deserved it, he then jumped in the factory team and is doing very well. Moreover, to have several Ducatis on the grid give the brand more visibility is really good, especially if the satellite riders are competitive as they are doing this year. So it’s a double goal: to grow the new talents and increase the brand visibility. BSN: Would you consider accepting the requests from more teams? GD’I: At the moment Ducati lines up six bikes. We would be able to provide more bikes, but then we need to consider the regulations. The rules in fact limit to six the number of riders on the grid per manufacturer. GD’I: No, no. Thank you.